Commonality is the key to affordability – on the assembly line; in shared-wing platforms; in common systems that enhance maintenance, field support and service interoperability; and in almost 100 percent commonality of the avionics suite. 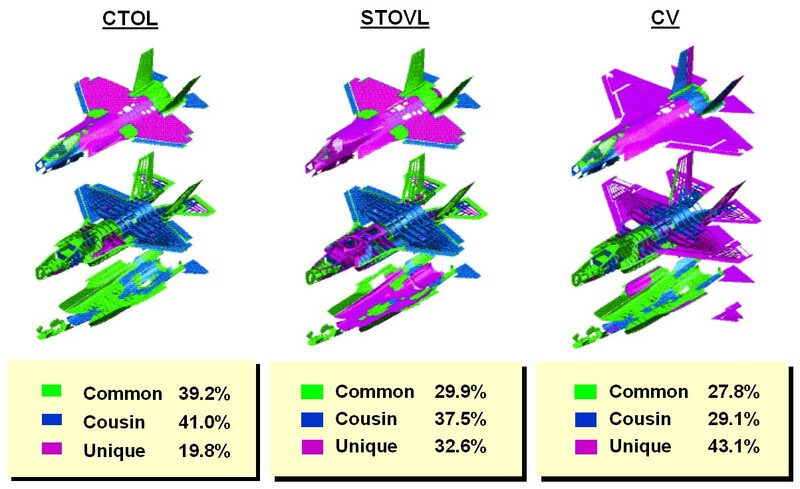 Component commonality across all three variants reduces unique spares requirements and the logistics footprint. In addition to reduced flyaway costs, the F-35 is designed to affordably integrate new technology during its entire life cycle. Besides providing low cost through design and manufacturing, the key to making a common aircraft viable is to give each service what it wants for a next-generation fighter. While each of the three service-specific models look very similar externally, subtle differences accommodate a relatively wide range of operational needs. All of the services want to fly at supersonic speeds and shoot air-to-air missiles and drop bombs on a target. But they all have vastly different operational suitability requirements. Simply put, the Air Force variant must be affordable, stealthy and match or better the performance characteristics of an F-16. The Marines add to these characteristics a short-takeoff/vertical landing capability. The Navy variant must be suitable for carrier operations and must complement the F/A-18E/F. Historically, these differences have kept the services from developing a common aircraft. The F-4 Phantom and A-7 Corsair, airplanes flown by both the Navy and Air Force, may seem to be exceptions. However, these aircraft were not originally designed for both services. They were Navy designs eventually adopted by the Air Force. The F-111 was a previous attempt at an aircraft designed for interservice use, but the Navy never found it acceptable. Congress wanted the lightweight fighter, what became the F-16, to be used by both services. But that initiative didn't get far, either. The Navy and Air Force use different fuels. Their AIM-9 missiles are not interchangeable. Their ejection seats are different. Their refueling systems are different. While they have good reasons for all of these differences, none of those reasons are good enough for the disparities to prevail. If the services can't get these low-level systems common, critics can rightly ask if they can share a top-level weapon system. The answer, though, is yes. But getting there takes some bold strokes by senior service leadership. Success for a common airplane depends on that top-level commitment. Designing a common aircraft is an exercise in defining what aspects to share among the services without reducing performance and what aspects to vary among the services without significant cost increases. Commonality can range from identical airframes and systems to completely different airframes with some shared systems. A completely common airplane, in theory, would carry the extra structural weight needed for carrier operations. But the extra structure is not needed by the Marines and Air Force. So, operational considerations determine most of the differences. Affordability and manufacturing considerations account for most of the similarities. All models of the Lockheed Martin design look essentially alike, with common outer mold lines across the fuselage and wingbox. They have common structural geometries, share identical wing sweeps and similar tail shapes, and carry weapons in two parallel bays located in front of the main landing gear. Major portions of the fuselage contain common or closely related parts, referred to as cousin parts. The canopy, radar, ejection system, subsystems and most of the avionics are currently common. The Lockheed Martin design also uses unitized structures to simplify manufacturing and reduce cost. Unitized structures are portions of the aircraft that can be produced as single parts instead of being assembled by hand from a multitude of pieces and hundreds of fasteners. The canopy frame, for example, is fabricated from a single aluminum casting with no fasteners. By comparison, the F-16 canopy frame has 48 parts, 70 shims, and about 500 fasteners. The JSF's inlet duct is another example. It consists of only three parts fabricated from composite fibers. Each piece of the duct, itself a complex shape, is created by a computer-controlled machine that accurately places composite fibers on a mandrel that then goes into an autoclave for curing. The process, called fiber placement, reduces the time and material associated with laying up complex composite shapes by hand. The company will apply other composite experience gained through its work on the F-22 program and the Japan FS-X program. The fighter's forward fuselage is another assembly that uses unitized structures. It consists of a unitized aluminum canopy sill, a one-piece cast titanium nose landing gear bay, two resin transfer-molded cockpit side panels, and several large fiberplaced skins and panels. This design approach reduces parts by more than 30 percent and fasteners by about a quarter compared with the F-16 forward fuselage. Bulkheads provide a good example of manufacturing commonality. Slight variations in thickness or shape, possibly a different material, might be needed to handle different load conditions for each service variant. These variations can be accommodated through common locating points and surfaces, tooling accessories and spacers, and visual work instructions. Moreover, numerically controlled machining can efficiently incorporate these slight variations with very little additional machine programming.